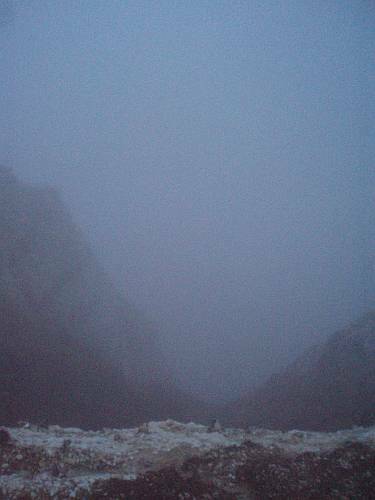 The fog is hanging low across the Chalk Downs as ahead of me the village of Freshwater huddles deep between the trees. The first streetlights of a November evening flicker weakly above the street. As inspiring landscapes go, perhaps this drizzly valley wouldn’t rate that high. But five miles run before the autumn daylight fades is precious, shrunken time, expanded on the trail. The village street is empty. A fine mist of rain would keep most folk inside, but in truth it’s almost perfect running weather. I loop around to find the path, cut into steps above the road through dense gorse and bramble. It climbs relentlessly between the trees, emerging breathlessly onto a chalky, flinty track under a darkening canopy of woods — branches of yew holding up grey clouds just a metre or so above. At last the path emerges from the underworld and in just a second my feet burst out into a longer stride across wide and grey-lit grassland, rising evenly towards a lurking hill unseen beyond. The evening silence is different here — wider, more expansive and with a distant, threatening edge. I skulk onwards more cautiously now — for all the firm, smooth ground beneath my feet, there’s a clifftop not all that far away. Open, yawning space fills the sky, as the empty horizon closes out direction and up or down. It’s unsettling, nauseating — yet an elemental elation fills my throat. A minute further through the void, I’m a mile or more from anyone who would hear me scream when a dark grey mass rears itself tall and high from unlikely, empty fog. 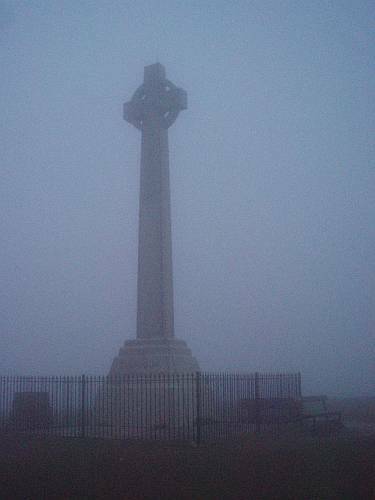 Atop this wild, forsaken hill there stands a cross. Soft sunlight fills another evening, shining warmly above a blue September sky. The cross stands in front of me now. Tall, solid, and beckoning out to sea. I stop to read the inscription. Alfred Lord Tennyson, from all his friends and admirers in America. And beneath the setting sun, I fancy I can imagine America, too, beyond the far horizon. I set off slowly westwards over Tennyson Down. Under a clear sky, across open grassland strewn with clumps of gorse. To my left, one hundred metres of fresh air, falling vertically to the sea. Tennyson walked these hills almost every day from Farringford, his house near Freshwater village, where my November run began. 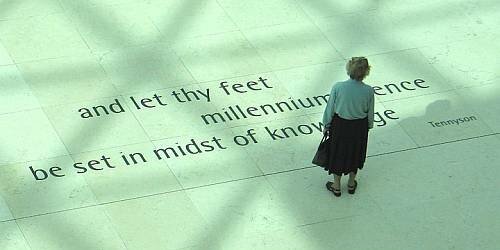 Tennyson’s lines run deep through the English we all use today. He coined ‘Nature red in tooth and claw,’ and ‘Better to have loved and lost, than never to have loved at all,’ — that was Tennyson, too. I keep running, with light and air around me and soft downland beneath my feet. 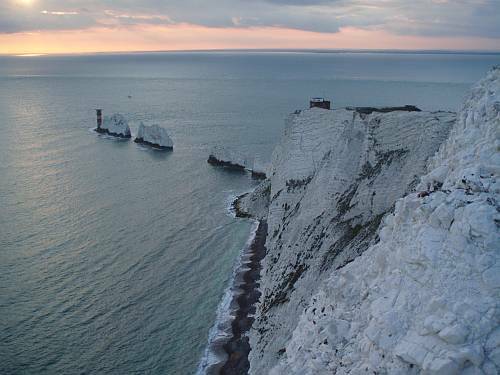 It’s three miles to reach The Needles — the spiky line of chalk pinnacles where the Isle of Wight runs out. There’s an old fortress battery here, built three hundred years ago to defend The Solent against Napoleon’s fleet, and not far away beneath the cliff, the rocket testing station where Britain proved its nuclear deterrent in the even more frightful days of the 1950s. Looking southeastwards from the ridge and along the coast, the Cretaceous stratigraphy is laid out before me, rising northwards from reddish brown alluvial sands and muds of Lower Cretaceous age into white Chalk laid down beneath a warm and tropical sea as the Atlantic Ocean widened over 100 million years ago. To the west lies Poole Bay and unseen two miles beneath its shores, 500 million barrels of Wytch Farm, the largest onshore oilfield in Western Europe. 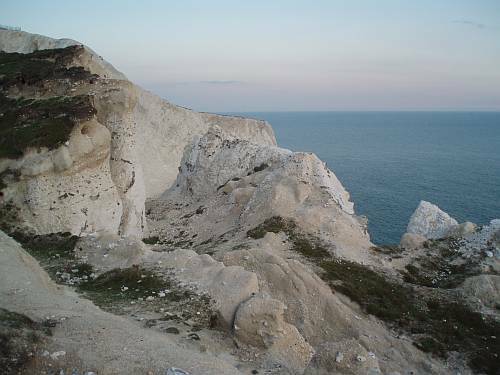 Looking northeastwards across Alum Bay, the Chalk is overlain by a cover of younger Palaeocene rocks. These variegated sands were laid down by river systems some sixty million years ago, after sea-levels had fallen markedly around the world. 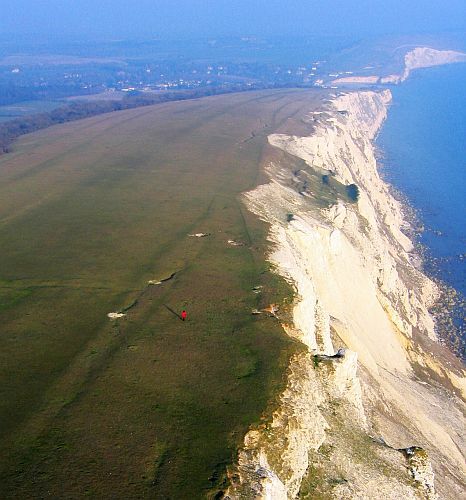 The Chalk and sands above both dip steeply northwards to form a monoclinal fold. As Africa collided with Europe some 2000 km south of here and around thirty million years ago, these strata were upended above a major crustal fault like a piece of rucked up carpet. The forces required to bend and break the rocks is unimaginable, and yet they’re evident wherever earthquakes are occurring today. Here in Northern Europe, the deformation process renewed itself as Spain in turn was pushed northwards into the soft underbelly of France, leading to the rise of the youthful Pyrenees while the Alps were still the tallest mountains on the planet. But finally, a kind of calm resumed before the deposition of the gently-dipping Eocene strata now visible to my left on the north of the monocline. Once, many years ago, my grandmother returned from her holiday in the Isle of Wight with a souvenir pack of coloured sands from Alum Bay — the first geological specimens I ever owned. 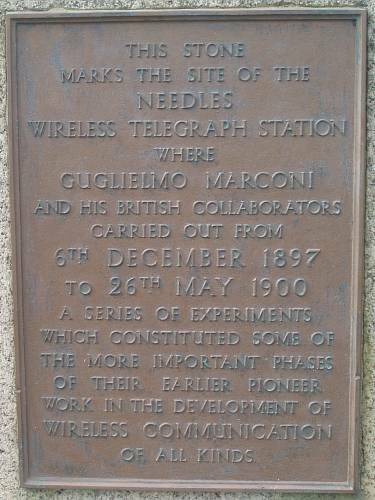 Today, holiday makers plying to and from the beach pass an unassuming plaque where Marconi carried out the world’s first offshore wireless transmissions in 1899, just two years before my grandmother has born. How the world and communications have changed since then. 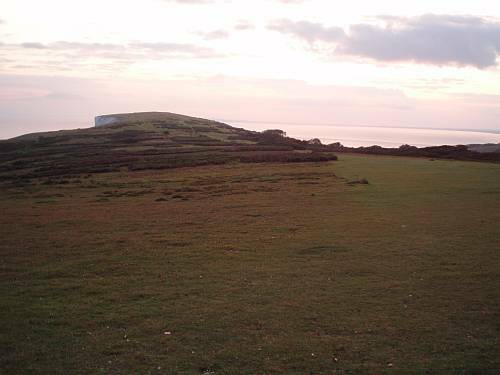 As I run back eastwards, the low sun lights up mounds and hollows set into the contours of West Long Down, marking the greens and tees of the original Freshwater Bay golf course. From here, three miles of soft and forgiving turf will bring me back across Tennyson Down to reach the village once again. I pause beside the Tennyson Memorial one more time. The Isle of Wight and the English Channel beyond stretch out far in front of me, the evening quiet except for the rushing of the breeze across the cliffs. Tennyson loved this air — worth sixpence a pint, he claimed. And at that rate, a runner is rich indeed. 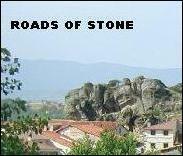 This entry was posted in 2011, geology, heroes, history, poetry, winter. Bookmark the permalink. 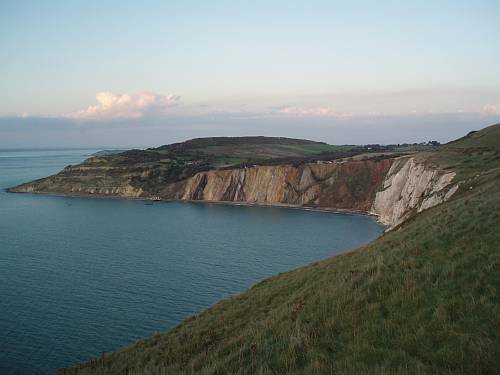 We love Tennyson Down, it’s one of the nicest places to walk when we stay at our holiday cottage in Totland. 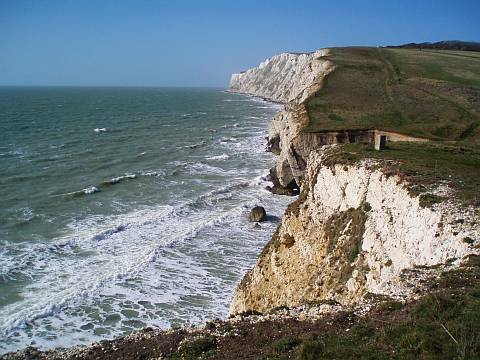 We would particularly recommend walking up from Totland through Headon Warren to Tennyson Down, and then past the monument and down eastwards to Freshwater from where you can retrace your steps. 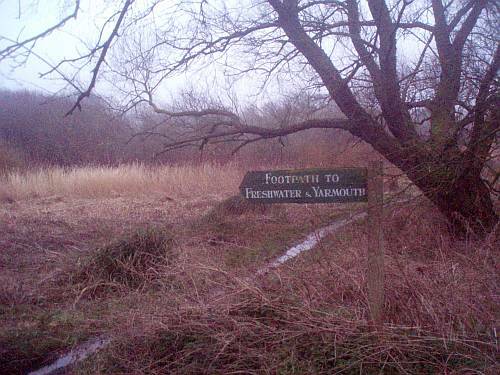 This is a good long walk but is fantastic, especially if you manage to catch a sunset in the process.